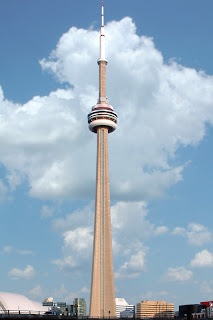 The tallest cell-phone tower in the world. It is a few days into my state-imposed exile from Paris. For those of you that haven’t already surmised from my writings, I intend to make a grand return to Paris… permanently if possible. More often than not I agree with the aphorisms of Friedrich Nietzsche, who once wrote, "An artist has no home in Europe except in Paris." Of course you can guess that I’m in complete agreement with this one and would go so far as to expand the word Europe to include the rest of the western world. Since leaving Paris, I’ve landed in Toronto, the cultural and business capital of Canada and moved along quickly to New York, the… well I’ll let you look up New York on your own. Here is what I have noticed. 1. I don’t understand English any longer. The accents in Toronto and New York are so widely varied, that I can’t understand anything at first. My brain is still listening for French and hoping to have a chance at translating as many of the words as possible. It then gets heavily accented English and the translator garbles and dies. I have to say, “Pardon me” twenty times a day. 2. I’m going through crème de camembert withdrawal. The symptoms for this are a constant feeling of hunger even after eating, the shakes and staring into a full fridge endlessly while seeing nothing to eat. I managed to go to a NYC supermarket, only to discover that they had no food that would be suitable for anything other than pets. 3. Restaurants are not what I remembered. I know it has only been three months, but the first restaurant that I sat down in had about two dozen selections, each looking more disgusting than the last. Would I like this greasy fried up piece of rubbery mystery meat or that piece of greasy fried up piece of rubbery mystery meat? This was a question that I could not answer without feeling nausea. I see now why restaurants provide catsup at the table. It is about the only sauce that is strong enough to mask the taste of the terrible food that you will be served. OMG!?!?! Have I become a food snob? 4. This was my first time in the streets of Toronto, and I found the city to be pleasant and a little cleaner than I expected. The ethnic mix was somewhat similar to Paris, as near as I could tell, but I could not tell if the coupling and groups of friends were as mixed as in Paris. 6. I got to see Toronto’s famous Younge Street, the world’s longest street. In the time I had I saw about 10 blocks of it, all lined with shops. About 5 blocks up from Bay Street, I came across what I believe to be the Welfare or Social Assistance office and I swear on my life that a guy came out of the office holding a cheque and wearing a top hat. I think out of principle, the government should not give any quantity of money to anyone wearing a top hat. 7. Toronto’s subway system is very clean and very homogenous. Every station looks the same and every station is tiled, looking like a scene from The Matrix. I could totally see myself kung-fuing an agent across the tracks into a wall and sending shards of tile flying everywhere. Unfortunately, I had a plane to catch and no time to try my kung fu. 8. There are short little flights over from Toronto, with a total flight time of about an hour or so. The airport experience is considerably longer than the flight. Like Vancouver, you go through customs while still in Canada, which is convenient if you look too muslimy, you don’t have to fly back to Canada to change into something less muslimy. 9. I don’t know if this always happens on short flights between big cities, but through sheer circumstance I got into a spirited debate with the person sitting next to me about how many consultants would be needed to perform certain tasks. I thought he was on the high side, but after things were done he agreed to show me the job he was on when I made it back to Toronto. As it happens, he turned out to be the CEO of the largest consulting firm on the planet. It was a good contact to make, I’m tempted to think. 10. There are vampires in New York, but from what I can tell they are all loners or keep to small groups. There don't seem to be any rules here according to a local vampire hunter who was surprised by my reports from Paris. New York vampires often suffer illness or even death from drinking contaminated blood and this keeps their numbers from exploding. 11. I have a cousin in NYC, who had my Halloween plans all sorted before I arrived. I honestly can’t tell if my experience here represents a typical visitor’s experience. Everyone I saw had a costume and every nook and cranny for miles had a place where one could comfortably carry on in costume. I suspect, however, that if someone were to continue to wear their costume for the rest of the year, they could do this largely unnoticed. Manhattan Island as seen from Weehawken N.J.
12. That's officially how many pounds I lost. I finally got to a scale in NYC and it looks like I lost a pound a week in Paris, just to get into those cool shirts. Hopefully I can lose just a few more and get a cool Parisian suit when I get back. I'll patent this diet soon! Well my friends, I’ll have a few more observations once I get into the city over the next few days. Hopefully I’ll get some great shots from downtown. Missing you all and see you soon!